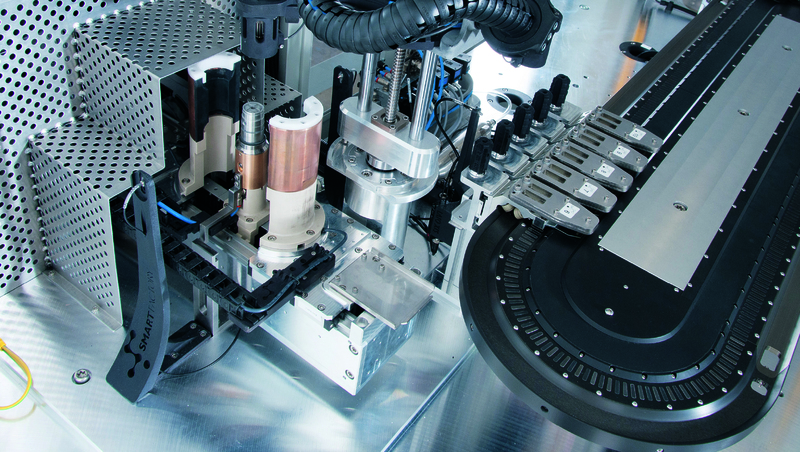 The Flexim Open Automation System combines modularity, flexibility, reconfigurability and connectivity to meet the requirements of small production lots right down to individualised production. Developed by Italian start-up company, Smart Factory, the system consists of a basic machine module that can be extended as required with standard or customer-specific production modules and flexibly adapted to individual applications. The XTS (extended transport system) from Beckhoff is the centerpiece of the Flexim solution. It can be linked to a wide range different processing modules in order to implement varying assembly or machining processes. In contrast to a classic rotary dial and index system, the XTS can be used to determine exactly how many parts per cycle are to be processed independently of each other in each station. That is, the slowest processing step will simply be carried out twice by two stations, without impeding the operation of the other stations. Beckhoff supplied the entire automation platform for the Flexim project, including the C6930-0050 industrial PC, digital and analog I/Os, safety and measurement terminals, AX5000 servo drives and AM8000 series of servomotors with one cable technology.